Free lunch, with a side of contempt. 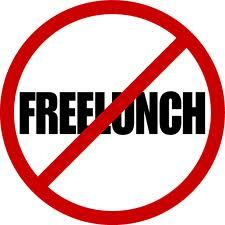 You know that old saw about there not being any such thing as a “free lunch”? I’m guessing that the contestants in the Canada Reads 2011 Hunger Games are thinking about that right about now. They are everywhere. I see them tweeting and facebooking and getting themselves “out there” like crazy. I see the producers of the Games have them singing for their suppers: “Holiday Gift Guides”? please. I wonder if they’re paid for that work by the CBC? (odds are, they aren’t.) There are podcasts and interviews and articles and tweets…. it’s kind of crazy making, really. I’m starting to feel a bit sorry for them. Not too much — really, it’s a great thing to be nominated and I’ll bet that it’s helped sales of their books. Always a good thing. I wonder, though, just how much dancing they’re doing? How much of their time is now taken up shilling for the CBC? I’m being a bit harsh here — perhaps belabouring it a bit to make a point. But here’s the thing, and it’s the same thing that’s been bugging me all along: where is the dignity in this? Why is it that the authors not only create the art, but then have to run around selling it too? Since when do they have to write freaking holiday gift guides in order for the Hunger Games overseers to publicize their books? I wonder what Flannery O’Connor would have put on her holiday gift guide or if she would have tweeted, tongue in cheek about how a “good book is hard to find”. Oh, how droll that would be, no? It would have helped the Hunger Games producers a lot, and would have been completely in keeping with the snide/sly/self-referential tone of the CBC Hunger Games’ branding. Speaking of which. Can I just say that my deep antipathy to the over-all tone of the CBC Canada Reads site — nay, the entire CBC Books portal — is growing daily. Sometimes I go there and cannot believe my eyes. I’m not sure what bothers me the most, but there are days when I just can’t manage to get past the tone of it. The “voice” is very clearly that of a twenty-something smarty pants who isn’t half as smart as she thinks she is. It is derisive and sly and just so insulting. With so many romance writers out there, I began to think: How hard can it be to whip one of those novels together? Not very, I told myself! There are how-to guides are all over the Internet. I’m smart. I’m creative. I can write coherent sentences. Surely, I can write a romance novel in a mere month. What better way to get intimately acquainted with this genre than to write one? Then I remembered that I am lazy. So, CBC Book Clubbers, I need your help. We’re going to write this romance novel together. I’ve consulted the eHarlequin guide to How to Write the Perfect Romance and learned the most important things involved in writing a successful romance novel. With that in mind, let’s begin! I’m as much of a book snob as the next person, but I’ve grown to respect the act of writing a little too much to let this pass without comment. I don’t get the derisive tone, I really don’t. Does she think this will endear her to the 78.4 million people who read romance novels every year, or to the authors who (even if you don’t like the genre) are crafting work that those (let me say it again) 78.4 million people read? This is a craft, and as usual she is lazily contemptuous of the creators of that craft. It’s not about the books at all, is it? The point she really seems to be trying to make is that she could do it, if she weren’t so darn lazy. This is who the CBC hired to help produce their books coverage? I’m still trying to figure out how being lazy is an endearing quality. Lazy is what made her link to only Quill & Quire reviews of the books in the Top 40, regardless of the quality of those reviews (spotty). Lazy is what creates this groundswell of contempt toward the CBC on the part of readers/listeners. Lazy is what makes authors write (for free) holiday gift guides instead of finding thoughtful commentary on their books to post. Lazy is being snarktastic without substance to back you up. Thing is, she’s a product of her age, and has created a niche for herself. She was probably hired by people a generation removed from her who don’t actually quite “get” the whole social media/twitter thing — who think she’s really connected because she and her friends all create the impression that they are a movement by incestuously (re)tweeting one another’s work and commenting on one another’s snarktastic websites. Maybe they think that this is how things work now…. but what she must think is insouciant irreverence has turned the corner, most of the time, into contempt. Perhaps she doesn’t realize it? Who knows. So, it’s not just me. There’s a groundswell out there of growing contempt for this type of arts… marketing (reportage? branding? I don’t even know what to call it.) 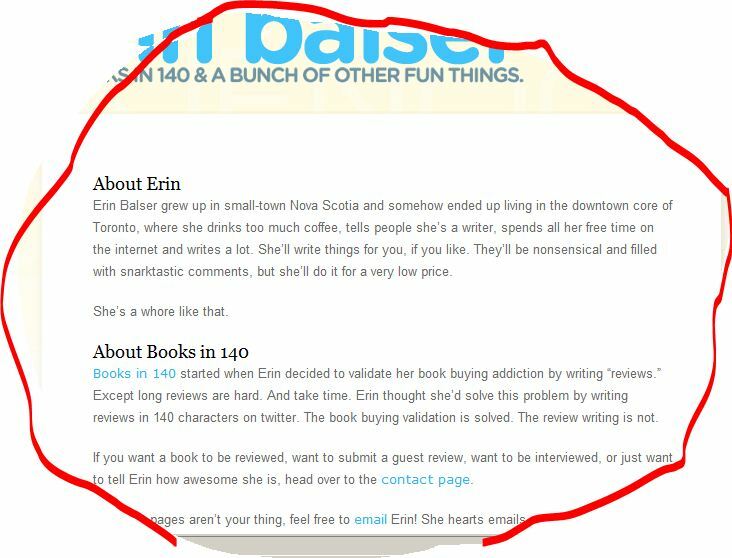 My feeling, whenever I read something she’s written is that no matter the subject, it’s really an exercise in selling Erin Balser. I’m going to keep writing about this stuff. Odds are I’m going to see things that I disagree with. Reading the drivel that keeps getting put out there under the umbrella of the CBC Books makes me crazy. Can you see Erin and Eleanor Wachtel at lunch, talking literature? Or even with Shelagh Rogers — what a great meeting of the mind that would be. Eventually, though, I’ll have had enough. I do want the CBC to know that it’s because she’s lazy that I’ll have stopped listening and reading.